In addition to raising serious questions about how the NYPD uses force on civilians, Eric Garner’s death from an illegal chokehold — the result of a group of cops trying to arrest him for selling loose cigarettes — has sharpened public scrutiny of the department’s “broken windows” policy. The strategy, which Bill Bratton implemented during his first turn as New York’s police commissioner in the ‘90s, encourages officers issue crack downs on offenses such as drinking and urinating in public, biking on the sidewalk, hanging out in parks after-hours, and dancing on the subway in the hopes of deterring serious crimes. The New York Daily News took a look at the data related to the enforcement of these quality-of-life laws and — depressingly but unsurprisingly — found that men of color are much, much more likely than anyone else to be written. And, of course, officers are more vigilant in lower income, less white neighborhoods: Mott Haven, Melrose, East New York, Brownsville, Highbridge, and Bed-Stuy had the highest rate of summonses (the figures ranged from 197.6 to 271.2 per 100 residents). If those statistics seem familiar, it’s probably because they’re a lot like those associated with one of the NYPD’s other unevenly enforced policies — the better-known stop-and-frisk. Many of the same advocacy groups that successfully pushed for stop-and-frisk reform are now planning to devote similar attention to “broken windows,” though it’s not clear if they can have the same effect. 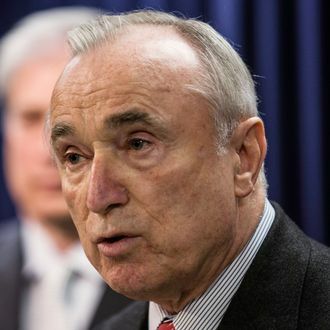 Though Bratton has vowed to retrain his officers so that they are less likely to injure — or, as in Garner’s case, kill — people they’re attempting to bust, he and Mayor de Blasio seem committed to the continued prosecution of minor shenanigans. “But a violation of the law is a violation of the law,” said de Blasio last week at a press conference where he and Bratton discussed the post-Garner changes supposedly coming to the NYPD. Still, even if the quality-of-life crackdown is here to stay, it seems that continued pressure might at least force the authorities to make it a bit more fair. NYPD Retraining After Eric Garner: More Tasers?